This is a rare alien species which occasionally crops up in imported grass seed mixtures and which never persists for more a few seasons. 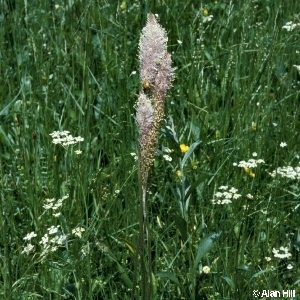 Unlike those of the native Plantago species, the flower spikes are pale pinkish-purple, the flowers are scented and they are insect-pollinated. 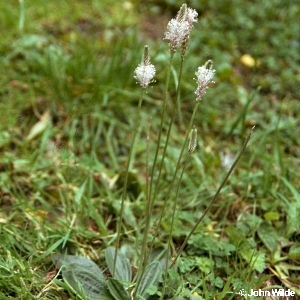 The hairy leaves are similar in shape to those of P. lanceolata. All names: Plantago media L.